End of one-child policy: Too little, too late? The end of China's one-child policy is unlikely to prevent a slump in the country's economy or effectively tackle its demographic challenges in the near future, say experts, even though the move could spark a rise in new births by up to 50 per cent in the near term. Experts are convinced that while birth rates might spike, they might not remain elevated. Nankai University's population expert Yuan Xin estimates the total number of babies born might peak at between 20 million and 23 million before stabilising at about 18 million a year. Citing demographers' estimates, local media reports say between three million and eight million more babies could be born in 2017, the expected peak in numbers following the policy change. This would mean a rise in the number of births of up to almost 50 per cent from the 16.9 million last year. Observers say the government's move on Thursday - making 90 million Chinese couples eligible for a second child - might have been too little, too late. This is because of the time lag between any baby boom and its impact on the workforce, which shrank for the first time in 2012. Many couples may also still opt to have only one child. "It will be at least 15 years before babies born under the new regulations are old enough to join the workforce. Increased fertility rates will not provide a solution to the worsening demographic outlook in the coming decade," said Mr Chang Liu of Capital Economics. "The one-child policy has also been relaxed a number of times over the past decade without triggering the surge in new births that officials were hoping for," he noted, adding that the economic impact of the policy shift will likely be "small". The strict one-child policy has been progressively relaxed, with Beijing announcing in 2013 that couples could have two children if the mother or father was an only child. But this led to only 470,000 more babies last year, far below the two million expected annually. Still, policymakers are likely hoping for the interplay between demography and economy to be felt sooner rather than later. A population boost, for example, might lift consumption and aid the Chinese economy amid weakening growth. Its growth target of just 7 per cent this year is the weakest in a quarter century. A shrinking workforce has further dimmed China's economic outlook. Its working-age population, aged 15 to 59, is estimated to fall by 9 per cent from this year to 2030, according to United Nations figures released prior to Thursday's announcement. Coupled with an ageing population, this is likely to place greater stress on its US$10 trillion (S$14.1 trillion) economy, with growing concerns over the sustainability of the country's increasingly costly pension and health insurance systems. As such, experts say Beijing should look beyond just demographics to other engines of growth such as productivity. Growth in the workforce, for instance, made only a small contribution to China's development over the last 20 years, adding less than a percentage point on average to annual growth, Mr Chang noted. 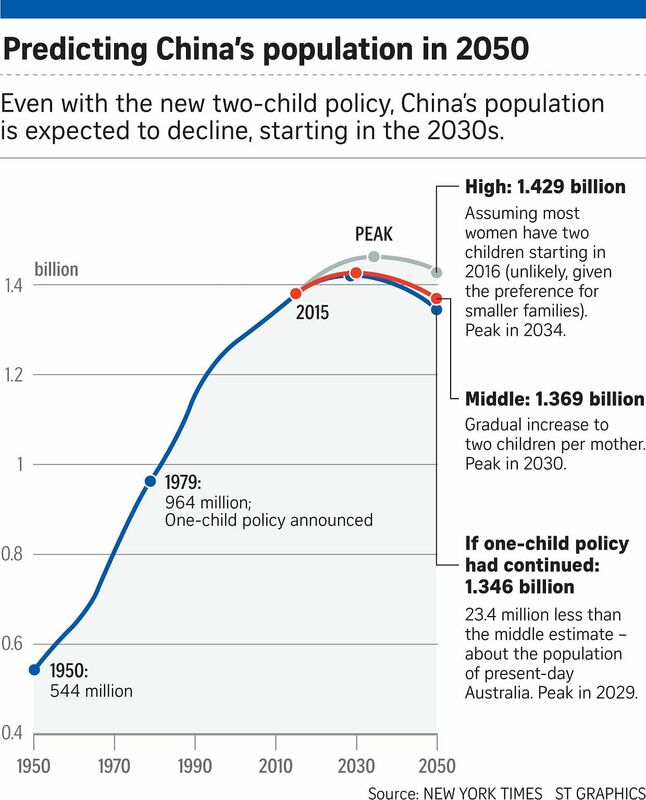 Still, the end of the one-child policy is likely to buy China more time in tackling its demographic time bomb. 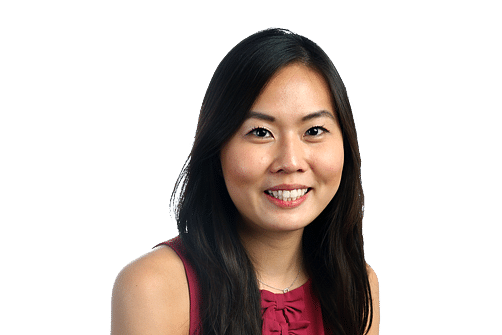 If the birth rate rises from the current 1.2 per cent to 1.4 per cent a year, the speed at which China's population ages will slow significantly, according to UBS economist Zhang Ning. "The population can be expected to peak at close to 1.6 billion people around 2050 rather than 1.4 billion around 2025 to 2030," he added. The policy change lit up social media, with the topic trending at the top of Twitter-like Sina Weibo within hours of the announcement. Some netizens said they would start trying for a second child that night.